Phostacon PDPP (Phenyl diisodecyl phosphite) is a clear liquid whih has C26H47O3P as hmialformula. It is an alkyl-aryl phosphite which finds its application as a color and processing stabilizer in ABS, polycarbonate, polyurethane, coatings and PET fiber where regulatory approval for food contact is not required. It can be used as a secondary stabilizer to improve color and heat stability in PVC. Phenyl diisodecyl phosphite is also known as phosphorous acid diisodecyl phenyl ester and diisodecyl phenyl phosphite. Available packaging: 190KG steel drums. Europe and United States: Provided Phostacon PDPP is on stock in our local warehouses our lead time is about one week if delivered in 190 KG drums. Store Phenyl Diisodecyl Phosphite in a cool, dry and well-ventilated area and in line with legal requirements. Keep PDDP away from heat sources and oxidizing agents. 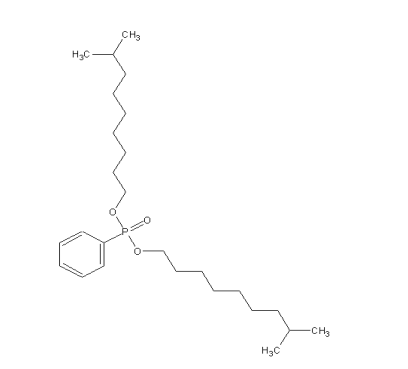 This substance (CAS: 2550-98-5) has been pre-registered under REACH (EC) 1907/2006. A Material Safety Data Sheets (MSDS) is available for Phostacon PDDP and all other products supplied by Vesta Intracon BV. An MSDS describes the hazards of a product and explains how a product can be safely handled, used and stored. Besides it provides important regulatory and emergency response information for the purchased product. Phenyl diisodecyl phosphite : Disclaimer. This information is supplied solely for informational purposes and Vesta Intracon bv makes no guarantees or warranties, either expressed or implied, with respect to the accuracy and use of this data. All product warranties and guarantees shall be governed by the Standard Terms of Sale. Nothing in this document is legal advice or is a substitute for competent legal advice.